Conquer design and gaming with Ryzen Threadripper. Based on the breakthrough Ryzen micro architecture, the AMD Ryzen Threadripper series CPUs are built with 14nm manufacturing process and incorporate unprecedented up to 16 Cores/32 Threads on a consumer desktop processor. The Threadripper has the power to overwhelm your most daunting workloads - you can render, stream, compile, encode, work and play - do everything, all at the same time. The Threadripper 1900X provides 8 cores / 16 threads of serious multi-processing power, while 20MB of combined cache and vast I/O from the enthusiast-grade AMD X399 platform stand ready to feed the beast. An unprecedented 64 PCIe Gen3 lanes to meet large GPU and NVMe needs. “Zen” cores are designed to efficiently use available microarchitectural resources for optimal compute performance. Compared to the previous architecture, three-tier cache system and new pre-fetch algorithms enable dramatically higher throughput in the cache and execution engines. The "Zen” architecture delivers >52% improvement in instructions-per-clock cycle over the previous generation AMD core, while maintaining the power usage at the same level. For users who demand a premium VR experience, AMD offers high-performance Ryzen VR Ready Premium processors. These select models meet or exceed the current top VR-HMD manufacturers Oculus Rift or HTC Vive recommended specifications for processors, helping ensure the best possible experiences within the virtual worlds you choose. Note: AMD product warranty does not cover damages caused by overclocking, even when overclocking is enabled via AMD hardware. 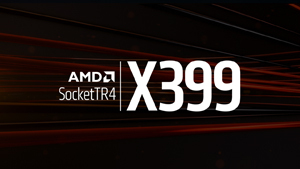 Built for creators who game, and gamers who create, the scalable AMD X399 chipset offers unprecedented expansion for serious multi-GPU and NVMe arrays. Meanwhile: quad channel DDR4, ECC support, and unlocked overclocking make X399 a lock for users that depend on serious computing.